Laxmikant-Pyarelal were assistant to Kalyanji-Anandji before they independently took on as music directors. Their first break came with the film Parasmani. For quite a while Shankar-Jaikishan, S.D. Burman, R.D. Burman, and Kalyanji-Anandji dominated Hindi film music. But towards the late sixties, Laxmikant-Pyarelal started started to pick up the popularity unassumingly. Steadily the displaced Shankar -Jaikishan. They have been around for 32 years and composed music for some 500 films. Their talent actually lay in the ability to compose memorable numbers throughout their career at a stupendous pace. After Raj-Kapoor’s association with Shankar-Jaikishan ended he assigned Laxmikant- Pyarelal to compose music for his romantic masterpiece Bobby . The stupendous success of Bobby was largely because of the music. Sargam was another musical hit of the duo's. Laxmikant-Pyarelal and Anand Bakshi's memorable association resulted in about 300 films. In the later years, they tasted success with the film Tezaab, and Ram Lakhan in 1980's . Their number ‘Jumma chumma’ in Hum or ‘Choli ke peeche’ in Khalnayak were instant hits. But as Laxmikant's health started getting worse they cut down on their work. Laxmikant was born in a poor family. He was quite impressed by mandolin and learnt to play it by his own. He used to play mandolin in street functions. Later, to earn some money, he started organizing Indian Classical Music concerts and started performing in them. He also started playing mandolin for Bollywood film music directors. Pyarelal was the son of a renowned trumpeter Pt. Ramprasad Sharma, who taught him the basics of music. He learnt to play violin from a Goan called Anthony Gonsalves (Incidentally, Amitabh Bachchan's character was called Anthony Gonsalves in the movie Amar Akbar Anthony as a tribute to Mr. Gonsalves. The movie had music by Laxmi-Pyare). Pyarelal started learning violin at the age of 8 and practised it 8 to 12 hours daily. At the age of 12, he started playing violin in studios to earn money for his family, whose financial condition had deteriorated. Pyarelal often used to frequent the Bombay Chamber Orchestra and the Paranjoti Academy, where he would perfect his skills in the company of Goody Seervai, Coomi Wadia, Mehli Mehta and his son, Zubin Mehta. Laxmi-Pyare were not content with the payments being made to them for their music, so they decided to go to Madras, (now Chennai). But, it was the same story there. So, they returned back. Once Pyarelal decided to leave India and go to Venice to play for symphony orchestras, just like Zubin. However, he stayed back at Laxmikant's insistence. Some of Laxmi-Pyare's colleagues at this time included Pandit Shivkumar Sharma (Santoor) and Pandit Hariprasad Chaurasia (flute). Later, Shivkumar and Hariprasad also ventured in Bollywood as Shiv-Hari. Laxmi-Pyare worked with almost all reputed music directors (with the exception of O. P. Nayyar and Shankar-Jaikishan) of the 1950s. In 1953, they became assistants to Kalyanji-Anandji and worked with them as assistants till 1963. They worked as music arrangers for many music directors including Sachin Dev Burman (in Ziddi) and also for his son Rahul Dev Burman (in his first film Chhote Nawab). Laxmi-Pyare and R D Burman remained very good friends, even when Laxmi-Pyare started giving music independently. R D Burman played mouth organ for all songs of Dosti. Laxmikant once made a guest appearance playing role of himself as a Composer of Song "Dil Ki Baat" in Teri Kasam (1982), which had music by R D Burman. In their early days, Laxmi-Pyare's music was very similar to Shankar-Jaikishan's music, as Laxmikant was a great fan of theirs. Once Shankar even changed his orchestration to make sure that his music did not sound like Laxmi-Pyare's. Laxmi-Pyare's first film as music directors was not released. The first released movie which featured them as music directors was Babubhai Mistry's Parasmani (1963), which was a B-grade mythological film. Throughout their tenure as music directors, Laxmi-Pyare only used A-grade singers. Their mentor Lata Mangeshkar and Mohammad Rafi agreed to sing for them in spite of low budgets, and Laxmi-Pyare always remained indebted to them. In fact, both Mohammad Rafi and Lata has sung the maximum number of songs in their career for Laxmi-Pyare. When Rafi's career was sidelined due to Kishore Kumar's ascending star, Laxmi-Pyare continued to give patronage to Rafi, sometimes against filmmakers' wishes. Of course, they had a great rapport with Kishore Kumar as well. Laxmi-Pyare hit the big time with Rajshri Productions' 1964 film Dosti. The film had two newcomer heroes who never became popular, and the film was a success due to its music. Songs like Chahoonga main tujhe shaam savere and Rahi manava became very popular. At that time, many used to think that there was a single person by the name of Laxmikant Pyarelal. Laxmi-Pyare won their first Filmfare Best Music Director Award for the movie, ahead of stalwarts like Shankar-Jaikishan (for Sangam) and Madan Mohan (for Woh Kaun Thi?). After Dosti's success, Laxmi-Pyare started getting work from all major filmmakers. The rise of Laxmi-Pyare, Rahul Dev Burman, and Kalyanji-Anandji marked the end of an old era of Bollywood music, which belonged to Shankar-Jaikishan,Sachin Dev Burman,Naushad, C. Ramchandra, Khayyam, Madan Mohan, O. P. Nayyar, Roshan and others. The team of Laxmi-Pyare and lyricist Anand Bakshi churned out some of the most popular songs in Bollywood history. The combo composed songs for more than 250 movies. Anand Bakshi was the lyricist who wrote the maximum number of texts Laxmi-Pyare gave music to. He was actually the lyricist for all the films for which Laxmi-Pyare won Filmfare Awards, except their very first award. LP have been accused of 'buying' Filmfare awards frequently. Laxmi-Pyare gave Indian classical music as well as Western music. But they were most popular for their folk tunes and semi-classical music. In Shagird, they created Rock-n-Roll-style foot-tapping melodies. The film Karz is worth specially mentioning here where LP successfully, gave disco-like music, which is strongly remembered even now. Although not as a rule, Laxmikant mostly looked after vocals and Pyarelal used to take care of orchestration. Both had vast knowledge of various music generes, musical instruments and orchestra management. Lata Mangeshkar played a major role in shaping up the careers of LP. She sang the maximum numbers of songs for them. She sounds extremely melodious under the LP. Lata Mangeshkar and Laxmikant-Pyarelal shared a long, close and rewarding association. From 1963, to the next 35 years, Lata Mangeshkar and Laxmikant-Pyarelal were to chalk up around 700 songs together, which accounted for one in every 10 Hindi film songs recorded by the Melody Queen, and one of every four songs composed by the duo. Their work includes a variety and range; there were chart-slammers and classics, and chaalu numbers as well as connoisseur choices. LP worked with Mohammad Rafi, Kishore Kumar, Alka Yagnik, Kumar Sanu, Udit Narayan. However, they also gave big breaks to many newcomers like Shailender Singh, Kavita Krishnamurthy, Mohammed Aziz, Suresh Wadkar and Shabbir Kumar, Sukhwinder Singh, Vinod Rathod, Roop Kumar Rathod etc.Lp also introduced singer like Anuradha Podwal. After Laxmikant's death, Pyarelal has done some work independently. When the playback singer Kumar Sanu turned music director, he approached Pyarelal to arrange music for him. Pyarelal is to compose a song in Farah Khan's next film Om Shanti Om (2007). exception of O.P. Nayyar and Shankar-Jaikishan. * Laxmikant Pyarelal have given music to over 500 Hindi films. 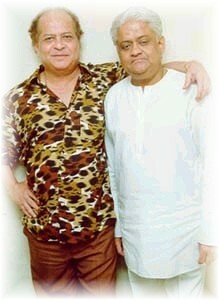 * Laxmikant Pyarelal are also winners of Indian Government’s prestigious Lata Mangeshkar Award. * Singer Lata Mangeshkar has sung the maximum number of songs in her career ever for this duo. Geetmala. After that LP's songs were regularly and prominently aired on the radio show. There used to be sixteen songs in each of the weekly Binaca Geetmala programme, more than half the numbers of the songs were of LP. There are certain weekly Binaca Geetmala programmes in which more than 13 out of 16 songs of LP were broadcast. * Even today, LP’s music is very popular all over India, even in the interior hearts of the country, and their music has always been more well-known than they personally ever were, contrary to all their contemporaries.